Two weeks ago, my father-in-law returned from a mission trip to Port-au-Prince, Haiti. He told Zach and I about the boisterous church services, Cajun-style meals, hopeless eyes, and the strange spiritual climate. His stories brought back memories of my time in Port-au-Prince. Five years ago this month, my group returned from that unique place. It touches each of our hearts even today. We are forever changed. According to my father-in-law, not much has changed in Haiti. 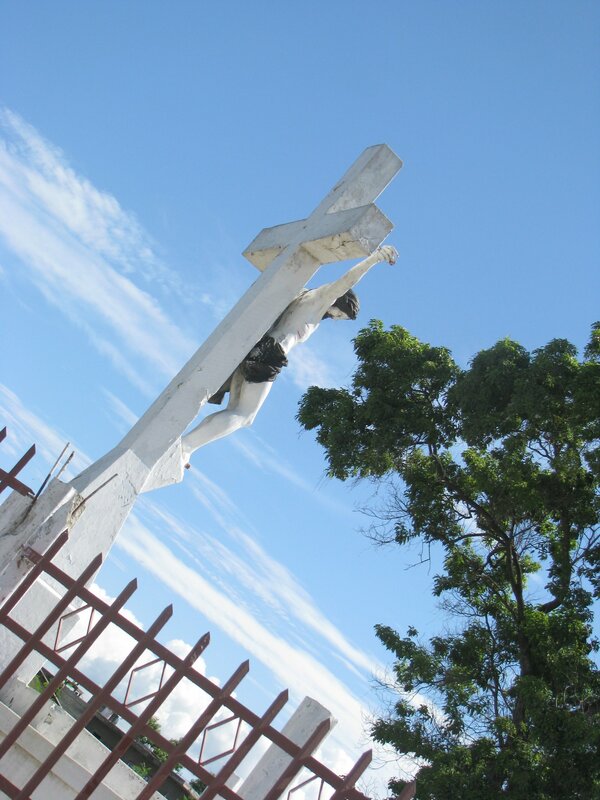 The Haitian Christians remain resilient. Many church groups still flock to Haiti’s lush hills to lend a hand. Yet, Haiti remains victim to its own past and actions. It needs our prayers more than ever. Not our money or kind thoughts, but our prayers. The following is a reflection I wrote for our church newsletter five years ago. My hope is that it inspires you to pray for Haiti today. When you descend through the Caribbean clouds and view Haiti for the first time, you realize it won’t be easy. Tiny blue and white tents grow larger and larger until you land. 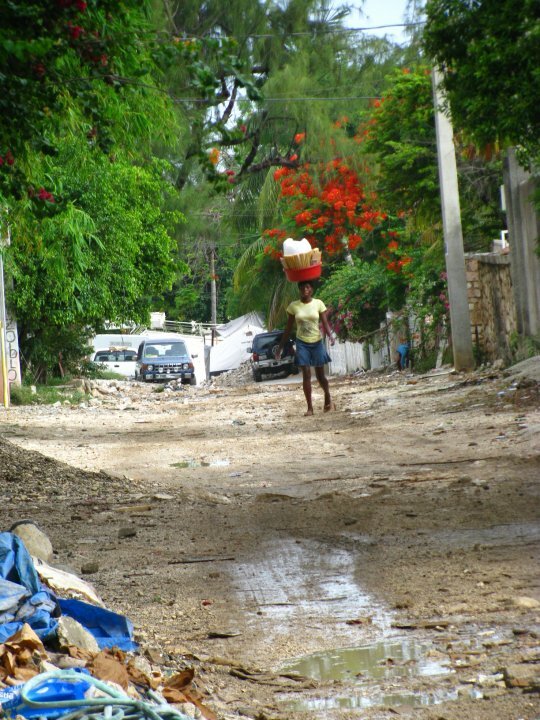 Then you step out into the heavy heat of Haiti and you’re in the thick of it. Smells from charcoal cooking pots hang heavy on the air. People speaking Creole surround you; some stare at you as you exit the airport and some return your wide smile. Poverty and culture shock hits you hard, but you’re too caught up in what you see to feel it. On the streets you see what you saw on the news, only it’s real. The streets are a steady stream of cars and people. School children in uniform hurry down the alleys and women balance giant basins of plantains on their heads. Men repaint the walls of their restaurants and auto parts stores. Advertisements for cell phones and Coca Cola abound in color along the roads. Where the houses are, collapsed walls and second story floors jut out. Everything is concrete; everything looks like a fallen house of cards. We watched all of this when making our way to the Florida House. Some snapped quick pictures of the foreign sights; others took the surroundings in quietly. At the house we felt enclosed. The sliding gates and security guards gave a sense of safety. But just over the walls, Haitian radio waves floated on the air as the neighbors cooked their evening meals. In Haiti, the sun goes down just after dinner and it comes back around early. After an early breakfast, the volunteers staying at the Florida House gather for devotions beneath a tall mango tree. Then wheel barrows and sledgehammers are loaded into a convoy of vehicles. Our group loaded backpacks of jump ropes, crayons, and Bible story books. For two weeks, we played with Haitian children of all kinds. They were the street kids from around the block; they were the school children blessed enough to afford an education. All of them smiled the brightest smiles you could imagine. Day after day, they faithfully came to see us even if the rain fell in sheets. We taught them games and they taught us to sing in Creole. The language barrier made some days difficult. But quickly we realized that soccer and laughter are universal languages. With the help of patient translators, we asked about the earthquake. 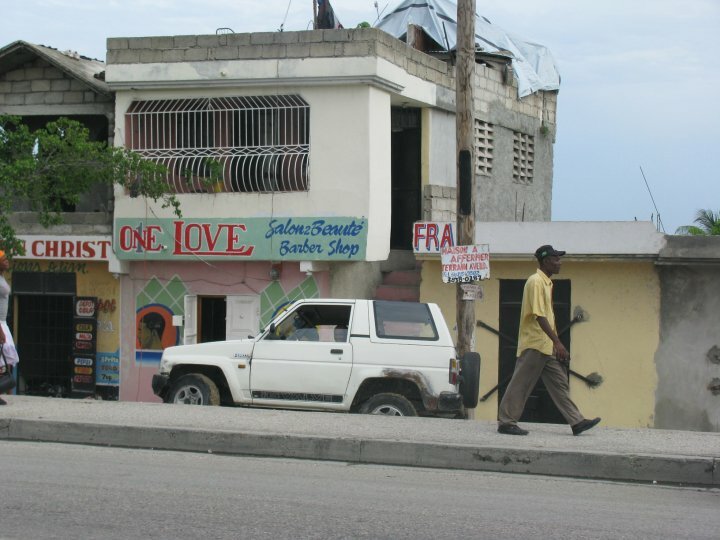 The Haitians openly shared their stories, hungry for a listening ear. The stories broke our hearts. The sights of Haiti broke our hearts. But we realized this: Haitians are a resilient people. Rubble flows onto the streets, yet they keep smiling. One million Haitians still live in tents while hurricane season looms on the waters, but they keep rebuilding. January seems so distant, but the memory of the earthquake will never leave them. Even so, their faith is indescribable. It’s the one thing I noticed most, one of the things I greatly envied of these kind-hearted people. As we flew out of Haiti, I reflected on their shining faith. From a window seat, I watched the Haitian shoreline turn into turquoise- blue water and caught sight of a rainbow. Though my time in Haiti had come to an end, it was then I realized that the resilient faith of the Haitians would be teaching me for the rest of my life.